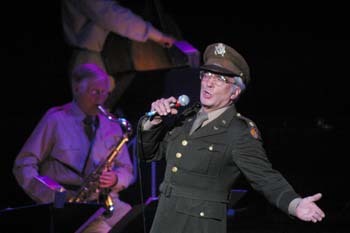 John Miller & His Orchestra, formerly The Herb Miller Orchestra, is the only Big Band in the world today performing the music of Glenn Miler with direct family links to the great man himself. Herb Miller developed his musical talent very much under the guidance of his elder brother Glenn, and went on to form various bands in America. But it was not until many years after the mysterious disappearance of Glenn that Herb decided he wanted to recreate the Miller Magic, and form an orchestra to play the music of his brother. Herb had worked in America for many years with his son John, a bass player, and when he decided to form the Herb Miller Orchestra John became his business partner and the featured singer with the band, and John and Herb came to Britain to form the orchestra, which now contains some of the best musicians in the country. Sadly, Herb Miller died in September 1987 and It is now through John Miller that the legacy continues. The band has undertaken many national and international tours, on their own and with guest artistes. It has undertaken radio and television appearences and has a catalogue of 5 CDs. Whilst playing for corporate events and dances, all their performances reflect the content of the concert performances - colourful and entertaining presentations of popular and less well-known items enlivened by humour and movement. The orchestra is 18 strong including John Miller himself as director/vocalist. John is joined in front of the band by lead vocalist, Fiona Paige, who is at the centre of great numbers like Chatanooga Choo Choo and I ve Gotta Gal In Kalamazoo. The band is often joined by Lindy Hop/Tap Dancers to add stunning dance routines to compliment the spectacular Big Band sound. Today, Glenn Miller's music is still in fashion and still sells millions of records every year. John says ......'I think Glenn would be pleased that the world still admires him and his music. And I think he would be pleased that the next Miller in line is going strong'. John Miller & His Orchestra continues the family tradition of delivering that Miller Magic!